With just a couple of weeks to go until the itinerary is announced for The Duke and Duchess of Cambridge's royal tour of Australia and New Zealand, Kate will now have a rather good idea of the engagements she will be undertaking. This will be Kate's third tour, after the Cambridges visited Canada and Los Angeles in 2011 and South-East Asia in 2012, however, this one promises to be the most hectic and packed one yet. From Christchurch to Canberra the couple will undertake several engagements per day over a 3.5 week period encompassing a whole host of events from the Sydney races to state dinners. No doubt there will be plenty of meetings underway with her private secretary Rebecca Deacon regarding the nature of the events, who the royals will be meeting, charitable organisations they will support, and of course, preparing an appropriate wardrobe with accompanying jewellery. It has been widely reported Her Majesty has selected items from her personal collection for Kate, including pieces with links to Australia and New Zealand, ensuring a personal touch is added - something royal ladies have been doing for generations. The Royal Vault contains some of the most magnificent and regal jewels in the world but which ones might we see the Duchess wearing in April? 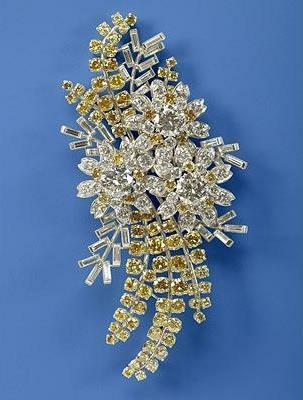 One piece which instantly comes to mind is the Australian Wattle Brooch. During the 1954 Commonwealth tour The Queen's State Gift from the government and people of Australia was this stunning brooch. The wattle is the floral emblem of Australia and it is said to hold a great sentimental significance for The Queen. Her Majesty wore it throughout her Australian tour, including a visit to Flemington Races in Melbourne. She has worn it on countless occasions since. 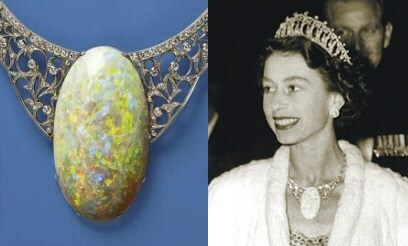 During the same tour in 1954, the South Australian people presented The Queen with the stone their region is best known for, the opal, as token of their loyalty and affection. The sizeable Andamooka Opal Necklace and Earrings. The opal weighs 203 carats and was found at the Andamooka Opal Fields in South Australia in 1949. It is said to be the finest quality opal ever discovered in the fields because of the size and the intensity of fire and flashes of colour it contains. The Queen wore the demi-parure just once during the trip as a courtesy, with the Cambridge Lovers Knot Tiara - a piece we know associate with the late Princess Diana. It has been retired to the vault since then, and though it's not a typical Kate piece, it is a possibility all the same. I imagine people in South Australia would love to see it have another outing. Another brooch we could see Her Royal Highness wear in Australia is the Hibiscus Brooch. It depicts two Australian hibiscus flowers with ruby centres. The beautiful piece was given to The Queen Mother as a gift from Australia. Following her death in 2002, it passed to The Queen, who has worn it several times including Prince William's passing our parade at Sandhurst. 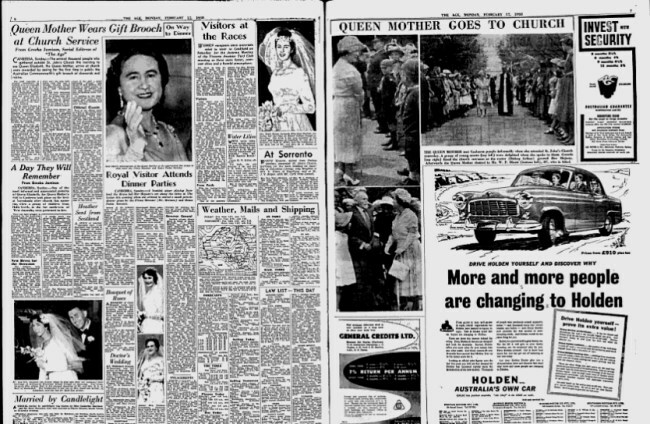 Whilst researching the brooch, I noticed an old newspaper article from 17 February 1958 in The Age featuring a piece about The Queen Mother's brooch. Should the Duchess wear it in April, it will fill column inches again - 46 years later. When New Zealand Prime Minister John Key visited Balmoral last September, he gave The Queen a vibrant blue brooch from Eyris Pearls in Christchurch (last week Prince William sent a letter to the residents of Christchurch three years after the tragic earthquake, indicating a visit is very much on the cards). I have a feeling there is a significant chance Kate will wear the brooch. During Mr. Key's visit the tour was discussed and when he meets the Cambridges during the tour it would be a real treat for him to see HRH wearing it. Next, we look at yet another piece Her Majesty received during her 1953/1954 world tour: The New Zealand Fern Brooch. The diamond and platinum brooch in the form of a silver fern - an important New Zealand Emblem - was a Christmas gift from the Women of Auckland. Aside from pieces with connections to New Zealand and Australia, Kate will need jewels for formal occasions. When Prince Charles and Princess Diana toured Australia in 1983, the Princess was equipped with a selection of incredible jewels ensuring she dazzled at every function. Let's take a look at some of the items Diana wore to give us a further glimpse into the royal vaults. The first piece we'll look at is one which needs no introduction for Diana fans. The Art Deco Emerald and Diamond Choker (better known for years as the Cambridge Emerald Choker because it was said it contained sixteen of Queen Mary's Cambridge emeralds; this description has since been altered). The necklace was inherited by The Queen who gave it to Diana as a wedding gift. It became one of Diana's signature pieces and many will recall her wearing it as a headband in Australia. Princess Diana was permitted to keep it after the divorce on condition it would be returned to the Royal Family after her death. It would be very interesting to see this piece again; Kate in an emerald choker....it sounds good! 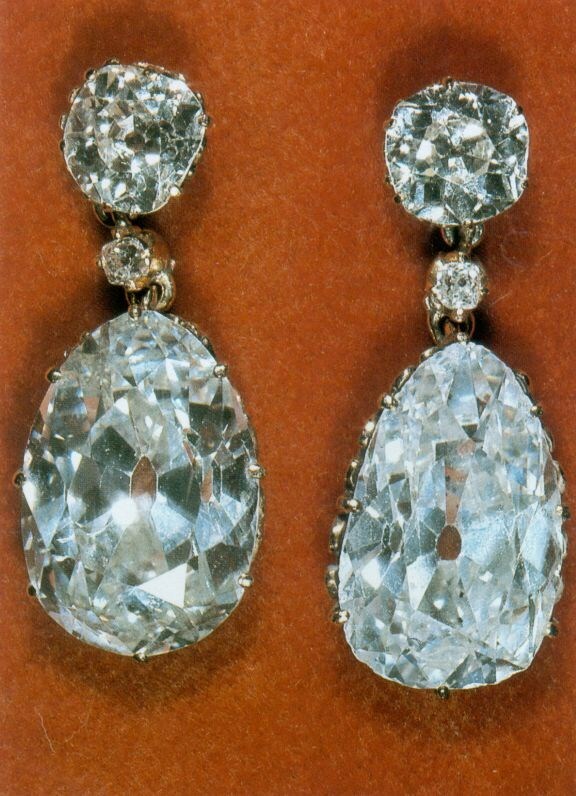 The Queen loaned Diana her Pear Drop Earrings. The striking pair were commissioned from Garrard by Her Majesty and made from family stones. There was also The King Faisal of Saudi Arabia necklace. Given to The Queen in 1967 by the King, it is designed in a fringe style with baguette cut and brilliant diamonds. It is a stunning statement piece. Kate may elect to take pieces from The Royal Collection she's already worn including The Queen's diamond chandelier earrings and the sparkling Nizam of Hyderabad necklace the Duchess wore earlier this month at The Portrait Gala. The Duchess will most likely be packing a tiara for the trip. I expect it will be either the Cartier Halo Tiara she wore on her wedding day or The Queen Mother's Papyrus Tiara she wore to the Annual Diplomatic Reception last year. Both are beautiful pieces, although I lean toward the Papyrus. Which do you prefer? Which jewels featured would you like to see The Duchess of Cambridge wearing? Thank you for this lovely post. I love reading your blog. I love all of the broaches and would love to see Catherine wearing them. I am not a fan of the open necklace, but it would be polite if worn, I am sure Catherine would be able to co-ordinate it withe her outfit. I love the Art Deco necklace, but was never happy with the way Diana wore it. Catherine would look wonderful in any tiara. I can't wait for the tour...and of course you regular updates. I also hope we see something of our beautiful Duchess before the tour. Many thanks Charlotte. Wonderful article again Charlotte! I prefer the Halo tiara. Do you think that there will be some engagements before the tour? wow, I hope I get to see Kate wear one of these stunning pieces of jewellery while she's in New Zealand! And even if I don't myself, my great-uncle is knighted, so he might get invited to something and I'll make him describe it for me! Let us know if he does. That's so exciting. It must be so hard counting down and waiting til she's there with Will and PG. how does one get knighted? That sounds honorary. he was the president of the court of appeal for a few years, and he was also a high court judge, aaaand he acted as governor general (the representative of the monarch in nz) for a couple of weeks like ten years ago while the actual governor general was out of the country! I can't remember when the Paris exhibit is over with. However, if the Halo tiara is returned in time and HRH wears it, i bet she will take her wedding acorn ear rings too. Have always loved the king faisal necklace, hope we see it soon. I agree! The King Faisal necklace is too beautiful for words to describe it! I would love to see Kate wearing it! Great post, thanks Charlotte. I am from Perth, Western Australia and would love to see Kate and Will's here, especially little George! Can't wait for the itinerary! I so hope she'll wear her wedding earrings again. A gift from her parents representing the newly created Middleton coat of arms, they must be very dear to her. I think she should enjoy them as a statement of her personal legacy--and because they are very beautiful and perfectly suited for Kate! I was just thinking the same thing! I wonder why Kate hasn't worn her wedding earrings again yet? She seems to wear that art deco, rectangular pair of diamond earrings when she has formal events. I'd love to see the wedding earrings, though. Diana only wore HER wedding earrings that one time, but those were on loan from her mother. Maybe Kate's wedding earrings will become a Middleton family heirloom and be worn for all Middleton weddings. We'll have to see with Pippa. I agree. I think she should represent her own family while she's there. I totally agree. Hopefully, she will wear them again in the near future. Eve, reading that in Germany you're facing a lovely and warm weather with 11,5 oC I just couldn't help the thought of how different we all are! When we get temperatures like that here, we are freezing cold! Last year, we had temperatures around 4oC and that's the coldest Winter we've ever had in São Paulo! My guess is that Kate's attire and jewels will be similar to the things she wore in Canada and southeast Asia. Otherwise, if she wears major royal jewelry, those areas might feel slighted. Keeping in mind that Diana was Princess of Wales, I think Kate's look as Duchess of Cambridge will be more modest. Even Diana did not wear a tiara in Australia or New Zealand. I do think it's possible the Queen will lend Kate her mother's Australian brooch and the New Zealand fern brooch, possibly even the wattle brooch. I agree, anonymous. The Duchess of Cambridge is a junior royal in spite of the fact that she is popular with the public. Her pieces will be less dramatic as a result. Also, folks, let's remember in our lust for seeing her decked out in Royal bling, that those large necklaces such as the Hyderabad are heavy. Remember, they're rocks! Big ones. Even much smaller pieces weigh enough to give a person a headache by evening's end. The brooches are a much more comfortable symbolic choice. I've just checked my trusty Jayne Fincher Illustrated Fashion Guide to the Princess of Wales and whilst you're right that Diana didn't wear a tiara on later tours to Australia and New Zealand, she did on the first tour. In 1983 she wore the Spencer tiara and the Queen's family order in Brisbane and again in Wellington, New Zealand. She also wore the Queen Mary tiara with the family order to a banquet in Auckland. Of course, none of this means that Kate will follow suit - Diana also wore hats to just about every engagement and I can't see Kate doing that at all. I am keeping my fingers crossed though that we see Kate in a tiara at least once (I don't mind which of the two it is, but I do think it will be one of the smaller ones she's already worn), and the family order would be great too - we haven't seen that on Kate yet. With regards to the other jewellery, after the maple leaf brooch in Canada I agree with you that the New Zealand fern is a pretty safe bet this time around. I wouldn't be too surprised to see Kate wearing it when she arrives. I think the blue Eyris pearl brooch is a possibility too - especially as the Queen is not doing long-haul tours any more and will not have a chance to wear it in New Zealand herself. Not sure about the opal necklace - I think it might swamp Kate. I'd also like to see her bring back that lovely necklace she wore to the Military Awards a couple of years ago (the one with the little red flowers on it) - at least that would be some of her own bling! Getting really excited now. Apart from anything else, I can't wait to see how much Prince George has changed since we last saw him. I guess he could be crawling and standing up with help by then, as Prince William was in 1983. Let's hope we get some engagements in March to keep us going. I remember reading at the time that Diana wore her necklaces around her head because the tiaras were forgotten at home. Not sure if it is true, but could explain why she didn't wear them. Caterine is "NOT" a junior royal. She is a "SENIOR" royal. Love your article Charlotte, as always! I would like to see Kate bring out a piece or two of new jewels, created specifically for her from existing jewels in the Queen's vault/collection. I have a question - do you think Kate will be given the Family Order from The Queen anytime soon? I realize none of the other granddaughters have the Family Order, but surely Kate deserves one being wife and mother of future Kings, right? That's a great question. I would love to know the answer too. Can you explain the Family Order. I have never heard of it. Pauline, no one's answered you yet, but here's what I found on Wikipedia. Lovely post Charlotte! I am so excited to see Kate in some exciting pieces, and I can't wait to see how she styles them with her wardrobe. I am with you on leaning towards the Papyrus tiara. Although I can't imagine her wearing it, I would LOVE to see her in the opal necklace. It is such an unusual piece, and it would be exciting to see her in something so out of the box and special. I'm just dying for her to take a bit of a risk with something unusual. This trip would be an excellent opportunity to try something a bit different, since there wouldn't be a question about why she is wearing the piece. It would be incredible for her to wear the Art Deco emerald and diamond chocker- it does seems a bit more suited to her style and would look fabulous with her coloring. Would love to see Kate wear some of the brooches. They aren't easily compatible with current fashions and Diana never wore them. But Kate is going to inherit an amazing collection someday and she has the power to bring them back into style. The New Zealand Eyris would be a perfect choice as it is youthful looking. There was great interest when the queen recently wore a lovely brooch she was given in Saskatchewan. It's nice to show these gifts are appreciated. 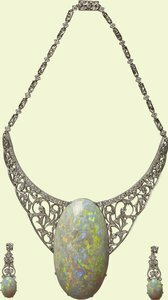 As for the opal necklace, I think it is fantastic but opals are considered bad luck by some, at least if it's not your birthstone. I suspect that may have been why the queen hasn't worn it again, plus it's not really her style. It is Kate's style, striking and contempory looking and perhaps she isn't superstitious. Surely, there's an exception for such a wonderful gift. If not, it's a shame Harry broke with Chelsy, she was born in October. As far as superstition, I think it's time Kate faced the Diana legacy boldly and wore some of her jewellery. But while she would look fabulous in the sapphires, I'm not sure chokers are really Kate's style. The emeralds would be so beautiful with her green eyes though. Can't think why they changed the name away from Cambridge. It's seems to make the necklace just generic art deco. Whatever Kate wears -and hopefully it will include a tiara, any tiara, at least once, I hope they choose carefully pieces that really suit her. There was a photo of her at the Portrait Gallery in Hello with one of the queen wearing the same necklace next to it, and it showed very clearly that besides being too fussy for Kate's look, the necklace was too short for her neck. The queen is tiny, while Kate is tall and willowly, and would look best in simpler bolder choices. There are plenty to be had in the royal collection and let's hope she makes use of at least a couple of them. I noticed the poor cut of the pear drop earrings too! We are used to perfect cuts nowadays, because gems are always cut under the microscope. Charlotte, you mentioned the earrings are assembled from family stones. Do you have any idea how old these stones are? I'm intrigued by that, because if they are really old it makes sense of course that they are precious to the royal family because of historical and emotional reasons, rather than their mere cut. Thanks for this post; i'm so looking forward to the tour! Hello, thank you so much for your comments everyone. I find royal jewels and the history associated with them fascinating and it's so nice to see a sense of tradition continuing. As for the stones, they're certainly not perfectly cut. The only info I could find stated they were from family stones. Another source claimed the stones have been with the royals for generations. I suppose what jewellery she takes will depend on the itinerary and the clothes she chooses. My preference of the two tiara she has worn is the "Halo"
I remember in her much younger days the Queen wore diamond hair ornaments, which I often think would look wonderful in Catherine's hair, but perhaps they have been made into something else by now. We ought to know quite soon just what they will be doing. Charlotte, amazing job! Thank you! I just can't wait to see the Duchess dazzling the World with these fantastic pieces of jewellery! I hope we get to see many stunning pieces in this tour and finally Kate wearing a tiara with a dress we can actually see LOL I'm crossing my fingers for the Halo tiara. Or maybe I'm a dreamer, but I would love to see Kate wearing the Cambridge Lovers Knot tiara. After all, she is the Duchess of Cambridge! And I think that's the most beautiful tiara of all time! I can't imagine how tiring this tour will be. Almost a month having to change your clothes 4 times per day, with barely no time to rest, with a baby, in a place with such a different weather and food than what you're used to... I can't say I envy them. But I also can't imagine the luxury and facilities they will have! So I just hope it's a succesful tour for the Duke and the Duchess! I absolutely adore them! Charlotte, do you think we're going to see George in the tour? To be honest, I have more fun thinking about how they'd look on me. That being said, although I do not like opals particularly and don't really care for that necklace, it is still speaking to me. I hope she wears it as I imagine it will really bring out her coloring. Personally, I love the Faisal necklace. Gorgeous. It also looks like it could be converted to a tiara? I can see Kate wearing the Wattle Brooch and Hibiscus Brooch in Australia and the brooch from John Key and NZ Fern Brooch in New Zealand. I'm sure she'll wear one of the statement necklaces, and a tiara would be very pretty--but you never know. At the state dinner in Malaysia, she wore a bespoke gown with drugstore cheap earrings. I'm sure whatever she chooses will be very pretty, and it will honor her host. Charlotte, thank you for the note about the opals. For my taste, the opal on that necklace should be ground in half--it's too big. And because of that, it is limiting; it can only be worn with certain clothes. I enjoyed your notes very much. The opal is my birthstone, and I agree that the stones themselves are very pretty, although I have never owned one. I suspect we will definitely see some of the brooches, easy to innclude in her outfits without too much work and an excellent way to honor the tour nations. Personally I would be suprised to see the Tiaras unless there is a white tie event, if its black tie I think we may get a necklace but not a tiara. i can't see her wearing alot more jewellry than she did in earlier tours, I think she prefers understated, given the number of times she has worn a statement set of bling is 3 times in 3 years! Excellent post. So many beautiful pieces to choose. I like the first two diamond brooches very much. I prefer the Halo tiara but wonder if one will be required. Great thought to wear her family crest acorn earrings. Opal is my birthstone and the large stone is very beautiful but the settings are terribly dated, and don't really suit Kate. To close, I was standing in line at the market last weekend and my eyes fell upon one of our US tabloids. The headline breathlessly reported that Kate was three months pregnant with a girl and had told William on Valentine's Day. I don't believe a word of it. I love all of the pieces except for the Opal, for some reason, I just don't see the beauty and elegance there. I really want to see Kate in the Cambridge Lover's Knot tiara. To me with her being the Duchess of Cambridge, it is just really appropriate and it just happens to be one of my favorite tiaras. I'd like to see Kate take some chance with the jewels (like Diana did when she wore the choker as a headband). I don't think Kate would do anything as daring as Diana and that is the difference (among many) between these two women -- Kate is much more conservative while Diana had a wild streak in her. Kate doesn't have to go crazy, just a little less conservative. As Anonymous 24 February 2014 15:23 points out, Kate is not the PofW yet, so she has not reached the rank of where Diana was. However, I think if William and Kate are representing the Queen abroad, then it would be completely appropriate to see her wear a tiara to a state dinner. I don't recall if there were state dinners in Canada. I think perhaps they did during the southeast Asia tour and while she didn't wear a tiara, she did have a beautiful gown on. However, I would think that they would be more insulted because she wore cheap (for the royal family) retail earrings that can be purchased by anybody more so than the lack of a tiara. Does anyone else feel perhaps maybe there could be resistance to stepping up the glamour on Kate/William's part? I think deep down, they seem like they feel that the glitz and glamour is frivolous and silly. For instance, when William was dressed up in the Order of the Garter one year, they showed Kate laughing and reports suggested she was laughing at the look of William in the outfit. This always bothered me because I like the fact they the couple is approachable, but I want them to also continue the traditions and majesty that only a royal family can bring. I completely agree, Lynn from CA. I have thought on several occasions that Catherine did not exhibit the seriousness or solemness of the occasion and honor of the tradition. The Queen always has had that sense of purpose about the traditions even when she was just 25! It is a different time, and that makes me sad. Lynn, I don't see it as W&K thinking the glitz and glamour is frivolous or silly. I think it's a combination of them being from a different generation AND being aware of the current economic climate. Of course they are royal and the will live the lifestyle, but I give them credit for not over doing it. I also believe that if Kate had started wearing major bling from day one, she would have been criticized for chasing William for exactly that reason. Anon 04:41. Correct, it is a different time and even the Queen is smiling these days when she would not have done so before (and was criticized for NOT doing so). On the occasions when Kate has been smiling or even enjoying a laugh, she was doing it along with other members of the royal family. Garter day was a perfect example; Harry and Camilla were enjoying the moment too. Nothing sad about it. It's called being human. Diana, besides being one of the aristocracy had a casual attitude about jewels and seemed to not take them seriously whereas Catherine seems overly cautious to not make a misstep. Diana DID wear tiaras in Australia !! Wonderful post! So much history behind the jewelry. Theyve been worn by such beauties in the past it only feels right that kate wear them too. i also love the Australian roots behind the pieces. Its interesting that australia is known for their opals. Ive never seen an opal with my own eyes. My favorite piece would have to be the eyris brooch. I'm not a fan a brooches in general but I would definitely wear that one. I'm excited to see the itinerary for the trip. I've never been to either country. My family passes down teacups to their next of kin but I will definitely be passing down some of my claudia bradby jewelry. With some of these pieces in the Royal Collection I think Kate is so slim they look too big on her - just my view...some of the more delicate pieces are lovely on her. I prefer the papyrus tiara and would love a better look at it on Kate and I hope she repeats that dress too as we never got a good look at it. I understand that the Queen has loaned the jewellery worn by the Duchess of Cornwall and the Countess of Wessex. If she were to gift the pieces now they could end up having to be sold to pay death duties, but anything passed on at death to the next monarch is tax free. This is an arrangement to ensure the collection remains intact for the future. I would expect the same arrangement will apply to Catherine. Actually you have that the wrong way round. Anything passed on at death is taxable and anything that escapes death duties has to have been gifted 7yrs prior death. What I appreciate about what Charlotte writes is that she bases it on facts & history & she understands that the fact that Catherine might be wearing some of these pieces is NOT because of these silly rumors that the Queen wants Catherine to have a fashion make-over, but rather, because it is simply the norm & tradition that royal women wear special pieces on royal tours that reflect the history of & special relationship between the countries. Each piece tells a story. It has nothing to do with the Queen wanting Catherine to make changes. If Catherine DOES wears some of these pieces it will be because she wants to and NOT because the Queen is forcing her to...as many of these silly rumors would have you believe. AMEN. I totally agree with you Lulu. The brooches seem very much Kate's style - remember how beautiful she looked with the Canada Maple Leaf on her first tour? And I would love to see her again in the Halo tiara with her own matching earrings. Kate doesn't seem to be a big fan of the statement necklaces. But that huge opal is stunning! Perhaps it should be reset as a pendant - that is something I could see Kate wearing. How fun it must be to have such a selection of jewels to choose from! Though the Andamooka Opal is not necessarily Kate's style, she has worn other collar-style necklaces. She could certainly pull it off with a simple shift dress. It might even be quite striking. If I were in her position and I knew that the necklace had only been given a courtesy outing, I would make an effort to wear it for the people of South Australia. Maybe that's just me. I would be very surprised if we see pieces on Kate that were closely associated with Diana, especially in the same context. Therefore, I think the Art Deco choker is out. Based on the Canadian tour, I think we'll see the brooches. I don't particularly care for them because I find the large brooches in general to be very old-fashioned, and it's certainly not Kate's personal taste to wear them. I think the Wattle Brooch would look much prettier on the Duchess as a hairpiece. Oooo! Fun stuff! That opal---wow! If she wears a tiara I'm hoping for the Papyrus. Although I think the Halo is prettier, we only got to see her in the Papyrus thru a car window. We need a better look at her in that one! I hoped and hoped that someone, somewhere would write about which jewels we might see Kate wearing in NZ and Australia. THANK YOU for doing so! Your parameters are perfect and take into account historical jewelry gifts to the queen from the peoples and governments of the Antipodes. Well done!! Wattle Brooch: Gorgeous stones. A bit dated in design, but the yellow and blue-white diamonds would look lovely against Kate's signature deep blue garments or a cream/gold ensemble. This seems like a definite piece in the running for Kate to pack. Although she gravitates towards simple and understated jewelry, she has worn precious brooches previously; particularly, the Maple Leaf Brooch on the North American tour. 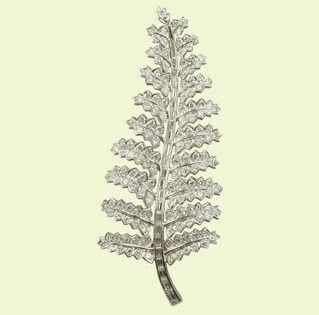 New Zealand Fern Brooch: Diamonds!!! I love this elegant design, so chic. A number of my friends preparing for their weddings have selected hairpins similar in design to this brooch. Is there a possibility that Kate might arrange this into an updo somehow, in lieu of a tiara? I love creative uses of jewelry. Cambridge Emeralds Choker: It's gorgeous. I prefer collar and statement necklaces, and I think Kate does as well. Although the green stones would look beautiful with her coloring, I don't predict this will make an appearance. The King Faisal of Saudi Arabia Necklace: Beautiful. This piece is more following the style of necklaces Kate has worn previously. It seems more understated in design (if baguette-cut and brilliant diamonds can ever be described as understated), which makes me think we will see this piece on the Duchess in the future, if not for the upcoming tour. 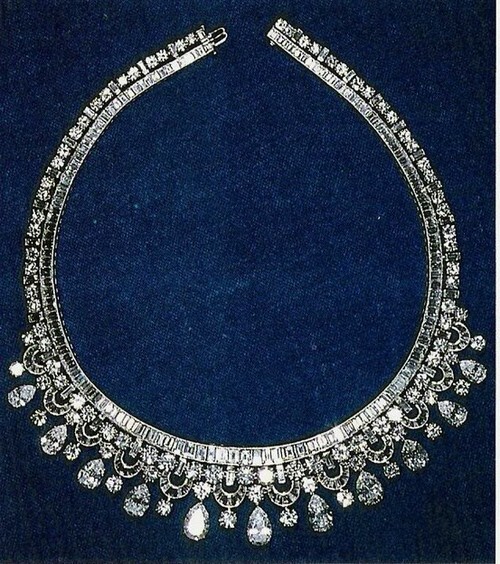 The Nizam of Hyderabad Necklace: The Duchess has already gotten her feet wet with this outrageous necklace. Why not take it out for another airing? Tiaras: I can't decide!! I would certainly love to see either. As some commenters mentioned previously, if the Cartier exhibition at the Grand Palais is finished a few weeks ahead of the tour, there could be time for the Halo Tiara to be couriered back to London prior to the Cambridges' departure. 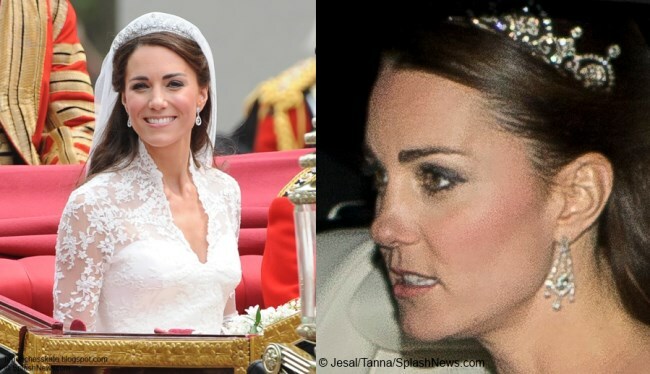 If Kate decides to wear the Halo Tiara, count me in with people who would love to see the return of her Robinson Pelham drop wedding earrings. However, the Papyrus Tiara attracts me with its more graceful and open design. Perhaps the Pear Drop Earrings or the Chandelier Earrings with the Papyrus! I am sorry to say it, but neither the Andamooka Opal Necklace and Earrings nor the Brooch from Eyris Pearls in Christchurch appeal to me. I adore opals, however, they do not photograph well; the way they "fire" in person is breathtaking. But even that is not enough to make up for the Andamookas' clunky (dare I say ugly?) design. 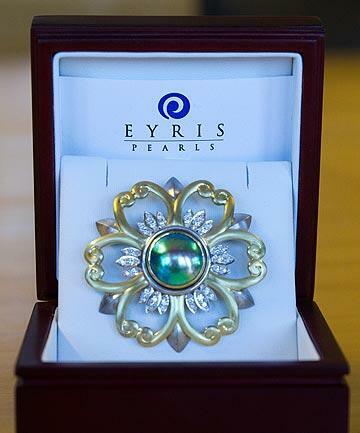 The Brooch from Eyris Pearls suffers from a similarly awkward design. The Hibiscus Brooch is quite lovely, but out of all the above brooches, I think the Wattle and the Fern beat it. Thank you again, Charlotte! I'm curious as to which pieces are your favorites in the running - asides from the Papyrus Tiara? Another brilliant post! It would be lovely to see Kate wear the Australian Wattle Brooch. There is a lot of expectation that Kate will be more 'royal' on this tour, but I don't think that will suit our relaxed Aussie culture. Our attitude to pomp and ceremony is very different to that of the UK. I guess we'll just have to wait and see! Though I'm trying not to get my hopes up, it would be wonderful if there were a tiara event and Kate wore the Papyrus. I'm dying to see a decent picture of her wearing it! I would love to see Kate wear the King Faisal diamond necklace; it's not as ornate or "heavy" as the one she wore recently. Personally, I adore the pear drop earrings. I think it's because the diamonds are just SO BIG and utterly gorgeous!!!! 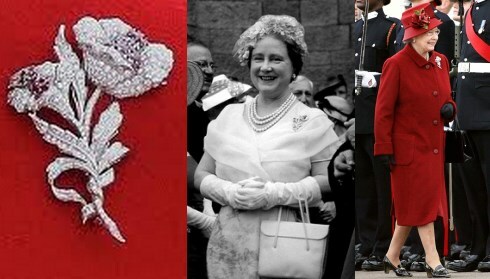 It would be really great to see her wear the fern brooch in NZ. I was lucky to have spent some time there several years ago, and could see how proud the Kiwis are of their fern symbol, so I think that would be a nice touch. It would also be great to see one of the tiaras, I don't mind which, both are fabulous. I think what we will most likely see are earrings (though probably not the pear ones) or a brooch. Either would be more understated than a necklace or tiara, because I don't think, from what we saw of how the last necklace was worn, that Kate is ready for the centre stage fashion focus that such a piece deserves. Hope I'm proved wrong!!! Finally just to add that reading this post and adding to the speculation is a fun way for a royal watcher to spend an otherwise dreary, wet Monday night. I will be dreaming about and wishing for those pear dropped diamond earrings for myself tonight!!!! i think it would be silly to worry if other counties are going to feel "slighted" if she wears those amazing jewels.. this is a different time. she's growing in her role as duchess, so I would love to see her in those pins and diamonds!! The King Faisal of Saudi Arabia necklace? YES, PLEASE!!!!!!!!!!!! I went back and looked at that enormous opal again. It really is a beautiful stone, but the filigree diamond necklace setting just seems so wrong. What if that stone were set in a cuff bracelet? Just a simple silver cuff might be quite striking. What if Catherine doesn't like a piece of jewellery?Must she wear it anyway? I don't see what Kate being a "junior" royal - although not very junior in the line of succession - has to do with what jewels or clothes she wears. Sophie, the Countess of Wessex, wife of the queen's youngest son, wears tiaras, jewels and gowns routinely when appropriate. So do many "lesser" members of the extended royal family. I think too much is being made here of the fact that Charles is ahead of William. William and Kate are representing the queen on the tour and are now allegedly fully working members of the royal family, not truly junior members like Beatrice and Eugenie or Zara who don't take on engagements routinely. When Diana wore her tiaras, the events were not always white tie. (I'm not sure any of them were.) She wore a tiara for official or state dinners and did not wear one for less official events. For instance, on her US visit in 1985, she wore a tiara to a reception at the British embassy but not to the dinner dance at the White House. Diana conrinued to wear tiaras as long as she toured officially with Charles. She is wearing one in those horribly sad pictures from the Korea just before the separation. Charles is wearing black tie. European royal ladies still wear tiaras quite often as does the queen so changing times may be only part of it. It seemed reasonable for Kate to stay informal on the Canada tour so soon after her marriage, it seemed optional on the Pacific tour. I think this time everyone thinks a touch more formality would be nice. I'm certain Kate would never be forced to wear something she didn't like, although, as with gifts all of us receive, the giver likes to see the item appreciated. It is certainly tactful to wear gifts at least once. It's pretty clear the queen did just that but didn't find the opal necklace her style (or is worried about the superstition, as was her great-grandmother Queen Alexandra.) I think the necklace might suit Kate's more contemporay look quite well but that will be up to her. I think all of us royal watchers and supporters would love to see Kate "kick it up a notch" and even in hard times, there can't be any objection to Kate wearing items from the royal collection. The choice probably comes down to her own personal taste and image of herself, as well as what William likes. Kate is not a "jr." royal. She is a "senior" royal since being married to William. Very well written! I really enjoyed reading your perspective. Thank you for sharing! I would like to see Kate not wear the halo tiara or her wedding earrings again. I would like her to preserve the memory of wearing them only at her wedding, to emphasize the specialness of that occasion, as never wearing her wedding gown again does. Similarly, I was disappointed when she recently wore the red McQueen dress again that she had worn for the Jubilee ceremonies. Since she didn't wear any distinctive jewelry on that occasion, I thought it would have been seemly for her never to repeat that dress as unique to that occasion. That may be impractical, but one can dream. All of these beautiful jewels, plus all of the pieces we may or may not see, will all belong to HRH when she becomes Queen. It's mind blowing! And that Royal Highness will be Camilla. Kate will have to wait inline. Surely you don't believe the queen will by- pass her son Charles to inherit the throne. William will come after Charles ...and Kate after Camilla. Thanks, Helen from Wiltshire, for correcting what I said about Diana wearing tiaras in Australia. The emerald choker photo is so famous that it has blotted out the tiaras! I still doubt whether Kate will wear a tiara in Australia, since she has only worn one once in London since her wedding. But I am looking forward to possibly seeing the fern and wattles brooches. 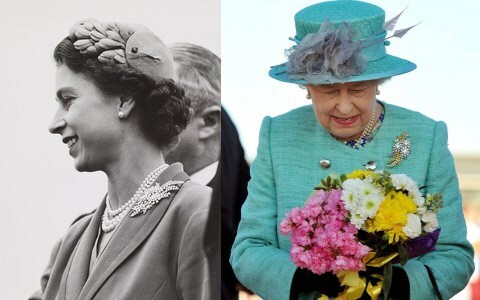 The wattles brooch is one of my favorite pieces of the Queen's jewelry, and I think the Queen agrees. I don't think Kate will wear the opal necklace. I must admit that I couldn't remember Diana in a tiara in Oz off the top of my head either - I had to go and look it up (I know, I'm a sad royal addict!). The fact that she didn't wear them again on later trips does tend to make my head agree with you that Kate may not be seen in one either; I guess my heart is just hoping. Somehow I can't see Kate wearing that choker as a headband instead though, can you? Thank you so much for this post. Your excellent and resourceful approach is making me very excited about the upcoming tour. I just have to say I love the opal set. I think Kate could make stunning use of it (although I'm somewhat superstitious about opals being unlucky for all but Libras). With something like the Roland Mouret gown, the opals would be fantastic. I also loved the pearl flower pin-again a unique piece that Kate could have some fun with. The other brooches are very lovely and reflect the important symbols of these Commonwealth countries but they tend to be a bit fussy and old-fashioned. Still-when the Royals wear them, they honour their hosts which is vital. I know I appreciated the diamond Maple Leaf when Kate came to Canada. I would like to see Kate wear a tiara-not every night but just to show that one can be part of her wardrobe. Actually, I'm looking forward to some of the casual/less dressy looks she might wear to be with George and to take part in some of the outdoor activities during the tour. One of my all time favourite outfits Kate wore in the jungle on the Southeast Asia tour-I think it was cargo trousers and a casual shirt. She was with William and they were tree climbing. I think it was in Borneo (?). Really glad you'll be bringing us all the tour news, dear Charlotte! All the best to all your readers as March approaches! In a famous 1954 painting called The Wattle Portrait, now hanging in the National Museum in Australia, the Queen wore the Nizam of Hyderabad necklace. I wonder whether this necklace is under consideration for Kate to wear during her tour. Interesting one of the first pieces of the Queen's jewels loaned to Kate has this strong connection with Australia. Thank you for the link. I didn't think the necklace was the best choice for Kate, but seeing this portrait says it all really. Thank you for this link. It was very interesting where it said that during the Queen's tour, nearly 3/4 of the population managed to see her in person. That's amazing! There must have been tremendous crowds wherever she went. That necklace surely has enormous personal significance for the Queen. So the fact that she lent it to Kate says a lot. Just checking in to see if you have anything regarding any joint engagements coming up for William & Kate. I really miss seeing them together. I know they are busy getting ready for the big tour and William is finishing up at Cambridge. But it would be nice to see them together. Thanks again my friend for this great blog & aqll your hard work. There's nothing announced for the moment. I expect Kate might present sprigs of shamrock at the St. Patrick's Day parade on the 17th though. First of all I need to say that I love this blog and all that you do Charlotte - thank you for all of your time and effort. What I really want to know is if those in Great Briton really think that Kate does enough work? I founded a non-profit organization myself and quit my professional job 3 years ago to be a full-time volunteer. I do not get paid, in fact my husband would say that it costs us money :). This week alone, I have made 3 appearances (at events and on tv). This is a pretty normal schedule for me. These are "public" appearances so to speak, I show up, speak or meet people. This does not count all of the "work" I do at home for the organization. This is a regional charity, not the United Way or the like - so we do not have a staff, paid positions, etc. I also have 2 young children. With my own work/life balance, it is difficult for me to understand why Kate does not have 1 to 3 appearances per week. I am grateful and humbled to be able to devote my life to helping others and I would not have it any other way. I have been given an amazing gift. It seems to me that Kate does not feel the same way. If I was in her position, I would do everything in my power to raise awareness of the causes that I am passionate about. Again, I am from the US, so as we say here, "I don't have a dog in this fight", but I would like to know what those that do think. Again, thanks for this blog, I have always loved the royals and am happy that Charlotte has agreed to take on this task. What an interesting perspective. Thanks. At the moment she is caring for her child---a most important job and also planning the tour of Australia and New Zealand. You chose what you wished to do, please leave others to do what they believe to be the most important..It saddens me that women feel it their right to criticize other women who choose to look after their own children. Firstly thank you for chiming in and thank you for the work you do. I have been curious about this subject for a long time myself and I look forward to hearing from the British folks, and from Charlotte herself. Perhaps it is because I was born and brought up in a republic I do not understand the sentiment that goes with having a monarchy. I do not understand why an entire population feels okay exulting a family, a group of people on whom they bestow immense priviledge. Having witnessed troubles and poverty first hand through my extensive travels in my teens and 20s I wish I had the financial means to do as you do - quit my job and help those in need. I love what I do, and I believe I make a contribution through my work, which is extremely cerebral, but still part of me feels that this is not a big enough legacy to leave to my children. It is difficult for me to understand the apathy, indifference and even contempt that William has shown for his position and that Kate seems to display through her continued absence. Her defenders will say that she has years of work ahead of us. Not quite. Life is not that long - at least not too long to be able to make a true difference. I wait for replies to this thread. Lastly, as far as the jewels, I believe that Kate will wear a number of brooches - perhaps all the ones shown here. I also believe she will wear one tiara and one fancy necklace, perhaps one pair of new fancy earrings. Other than that I think that she will be sticking to her past jewelry and longer hemlines. That is my prediction based on nothing really lol. You are preaching to my choir, Kentucky! You are a good person to do what you do. I'm going to get it for saying this, but there's really only one reason that makes sense as to why Kate doesn't do more engagements. She doesn't want to. I have a very hard, if not impossible, time believing that the Queen would tell her to work less. I don't even think Charles would tell her that, although I know there are some people who think that is true. I mean, when her great grandfather in law does more engagements at age 92 and having been ill . . . . . . . . .
bluhare, I too would like to see more of Kate, and more of William and Kate as a couple. Having said that, if the Queen wanted Kate to do more engagements, don't you think she would express that to her? And if she did, do you honestly believe that Kate would ignore it? I agree with bluehare. I think she just doesn't want to. I love kate immensely but her priorities are much different than other royals. I think that if she did more, people will say she's not taking care of George. And if shes at home more, people will say she's not doing her duties. She won't win. So she chose what she wanted knowing people would talk either way. I wish she did a little more. George will still grow up proper and love mum just the same even if she went out a few more times a month. I feel like I need to say that my children are my first priority, as they should be for any mother. They along with the call to devote my life to helping those less fortunate are the reason I left my job. It is vastly important to me for my children to see that helping others is also a priority in our family. I want them to grow up with a sense that it is your honor and privilege to be able to serve those in need. It is a legacy that I pray is so engrained in my children that they would never even consider doing otherwise. I fully believe women should be able to stay with their children or work, I have personally done both. My volunteer work allows me to be with my children all of the time, I never miss an event, lesson, etc,. I don't have a nanny, maid, etc and my husband's job is very demanding - most of the time it is just me with my boys. My youngest child was not yet 1 when I quit my job, so I completely understand the balance of having a baby and volunteering. I also understand the struggle to work full-time with a baby as I did with my first child. My mother keeps my kids while I go work for an hour or two, 1 to 3 times a week. I may not have fully explained my position in my first post. I believe that Kate should have the opportunity to care for her child, which she is doing and must be a blessing to her. With my volunteer work, it is difficult for me to understand when you have so much influence to make a difference in the world that you do not seize the opportunity, especially if it only requires a couple of hours a week and you have all of the help anyone could ever desire. Charlotte thank you for chiming in, it is probably that we will never know the answer. I guess I'm just disappointed that Kate does not do more. I also fear that at her age, she really should. She is not that young, most have established careers at her age, so maybe it is just not in her nature to be in public. I will never know the reason, but I hope that she is able to serve in the capacity that she is able. I am a tremendous Kate fan and I was hoping we see more of her soon. I don't necessarily think that Kate is saying no to engagements. I think that William has negotiated with the Queen and his father not to do engagements and not have Kate do engagements for now. He has made it clear through numerous interviews that he wants to postpone taking on royal duties for as long as possible. Here is what I think is going on - it is my opinion but I do have some confirmation of this through some private sources. During the Queen's jubilee do you remember the dour face he was wearing during the day of the boat ride and before and after ? That was when the RAF decisions were being made and I suspect that is when Charles and the QUeen were asking him to take on more duties. I think (and I have some confirmation on this) that William was asked to quit RAF, given a timeline and asked to commit to fulltime duties. Hence the dour face. But he did not immediately announce ANYTHING for months - and I remember everyone was speculating why. Why do you think it took SO long for his office to announce anything? Why has there been no formal committment of his routine or role yet ? Why do you think that is ? Look at Harry - we know what HE is going to do for the next two years. Why not for William ? It was because there were MANY MANY negotiations between William and the Palace on what his role was to be. They continued through 2012 and 2013 and I think that he is still pushing some boundaries. He knew and still knows that if he announced, he would have to commit, and he was NOT going to commit to royal life without a fight. As for the Queen putting her foot down, I think that she has learned from years of poor choices that strong-arming family members is not the way to go. So she has decided to engage with William while softly pushing her agenda. Kate is what they say in the East - like water. She will assume the shape of whatever container you pour her in. She is following her husband's lead, here. I do not know whether she WISHES to do more engagements - we will not know that. But just from common sense, a woman who has spent her 20s protected by her boyfriend and family, has not worked anywhere, has travelled to beaches and islands of the rich and famous may not really have developed a sense of what her role in the world is, beyond being a wife and now mother. She may slowly form her identity. But for now, it is difficult to give her any credit beyond putting up with William. Her sister Pippa on the other hand continues to impress me with her steadfast refusal to stop smiling. She makes fun of herself, she continues to put herself out there and she has not uttered a single sentence begrudging anything or anyone. William would do well to learn a thing or two from her. She and her parents, are, in my book the ones who come out looking like the REAL stars. Not Kate or William. Jean from Lancs, Kate is supported through the Crown. Indirectly through the Duchy (which you will recall is land of the British PEOPLE). The Royal family took this land and the people agreed to let them have it in exchange for services. Kate is free to be a stay at home mother and take care of her child like numerous woman do. However, she should then relinquish her place in the royal family and join others like Beatrice and Eugenie and Zara in supporting herself. Women are not bashing Kate for looking after her child. People are upset because their tax money supports the lifestyle and life of the Royal family and they want to see something in exchange. The Queen realizes this and has stressed this through numerous speeches. Charles realizes this and has acknowledged it. Why don't you ? @Portia All I will say is I totally disagree with your comments and that you should not go after someone who lives in England while you do not. And for your "private source" I think is a bunch of rubbish. interesting, Portia. Very interesting. Do you notice how many excuses people make for these two? The whole "William doesn't want to commit to royal life" stuff makes my blood boil. Don't want to commit to royal life? Fine. Then don't take the perks of said royal life. If what you posted is even halfway true, he's not the sort of man I'd want as my future King. Kentucky, Thank you for the goodness of your heart. And not just for thinking about it, but following through. Portia from Chicago, you have no idea how close to the truth you are. It's amazing to me how people gloss over the choreographed shiny public details and not see the slipped mask. The most frequently written comment on public message boards during/immediately the Jubilee boat ride was 'what the hell is up with William? Why does he look so dour and soar?' some commentors went as far as saying he possibly had an argument behind the scenes with Kate or his own family. When his mood/face didn't improve during the service the next day, he looked so tense throughout, the most frequent comment was that he had finally realised what Kingship meant and wasn't liking it one bit. Behind the scenes, a lot was going on, and you've touched upon it, so I won't repeat, but it's amazing to me how people gloss over the fact that his 'gap year' started in 2012 and not 2013. He is essentially on the 2nd year of his 'gap year'. As for duties, you only have to look at the differences in Harry's duties vs William's duties. Only next week Harry is representing the Queen at Nelson Mandela's memorial service at Westminster. This NZ/AUS tour is the first time William is being trusted with an important tour. We shall see if they don't organise cocktail parties and dinners meanwhile Harry goes to countries that have tricky relationships with Britain whether they are in the commonwealth or not, and does MORE than cocktails and parties. AND meets important people AND is given awards for his humanitarian efforts. I always enjoy Portia's posts because she sees clearly what people choose not to see, plus she works in media so probably has access to a lot of behind the scenes information that will only see the light of day in another 20yrs when the biographies are written. FTR, Kentucky, I'm from London. There are people who love Kate no matter what and don't question her choices and there are others who don't and do and a third lot that are completely indifferent. There is an awareness of her even for the indifferent lot, but as a punch line to a wag joke. The list of educated women who don't admire her except as an ornament grows based upon throwaway remarks that one hears occasionally. As for whether Kate will ever step up to the plate in her own right, at this point I highly doubt it. Her boss from Jigsaw said, 'she is someone who lives her life to be dictated to even when not needed,'which means that Kate works as she is told to work. Not because she's a mother or there is something else going on with her schedule that she can't get out of. As Portia has pointed out, William has negotiated something that keeps him below the radar. Kate follows William. IF HM or Charles changed their schedule and made them work more, they would, George be damned, meaning George isn't holding them back as some public imagine he does. Give it a rest. Please. Portia has very good opinions and I for one hope people like you do not drive her away. Interesting I've not seen your name before for someone with such a strong opinion. One would think you have been posting here. Very interesting article - I read the whole thing. Thanks for posting. The necklace really shows to advantage in the portrait. I was particularly appalled by the "naked Liz and Phil". :) I'm glad that came down within a week! This may seem a bit off the mark, but, what if Kate wore one of the brooches in her hair? A pretty up-do (or half-up-half-down) with a brooch as a sort of barrette.... I think it would be fashion-forward and really pretty. It can be her "choker-as-a tiara" moment! I am eagerly awaiting the tour and HRH's next public outing! And, as always, I can't wait for Charlotte's coverage and everyone's comments. Yes, Crown Princess Mary has been doing this for a while now. Very regal and elegant. I love the idea. By my count in an old book I have on the Australian tour in 1983, Diana wore tiaras on five different occasions, in Sidney, Brisbane, Tasmania and twice in New Zealand. That visit was considered an official visit. Not sure if the next two were and Diana didn't wear tiaras on the couple of formal events on those tours. But she did wear a tiara on tours in Canada, Portugual, Germany Korea, the US and on at least three different occasions on a middle eastern tour. None of these occasions were white tie, at least judging from the men''s attire. It seems to have more to do whether the event was a state dinner or reception or a less official affair. So time will tell on what Kate does. Five tiara appearances seems unlikely but at least one would be welcome. I'm afraid a lot of people are getting impatient with Kate's few appearances. As the lady from Kentucky wrote, there are ways of balancing family life and charity work. Doing a couple of engagements a week would be welcome and still leave ample time for George. Bunching her appearances together looks like Kate really doesn't like her duties and is trying to get them all over with at once. Hopefully, the pace will pick up after the tour. As an old family expression goes, everyone falls in a hole at some point but if you fall in too deep, you may not be able to scramble out again. Kate may find her work-shy reputation becomes solidly ingrained if she's not careful. She has so much she could offer, I hope that won't be the case. To use another US phrase, if Kate were out in public as much as some of us would like to see her, given the way she attracts the cameras, she would probably be seen as "hogging the spotlight." I suspect that her schedule is purposely moderate for the time being. For a long time she had life in Anglesey as the reason; now she has Prince George to care for. And of course her husband is similarly busy with other duties, formerly military, now training for the future. Both of them no doubt pay a good deal of attention to their charities in a quiet way, as well as to their son and plans for their tour. Considering the way news of William's and Kate's activities overshadows everything else when they are on tour abroad, one can understand that a balance with the rest of the royal family has to be maintained most of the time. I share your view on this. I'd like to see her do more at this point, but I don't believe that she is calling the shots. I think the royals (Charles) are so afraid of another Diana-type eclipse that they don't want her to be seen more while C&C slowly shift into a more prominent position with the Queen doing less as time goes by. The number of engagement Kate carries out is something I'm asked about frequently. Truthfully, I had anticipated there would be more at this point. Obviously Kate is caring for George and that is her number one priority but I am surprised there isn't one a week. No one can be certain about the reasons for this, however I imagine if HM wanted William and Kate to be doing more they would be. That's exactly my feeling, Charlotte. If the Queen wanted them to do more, they would be. Kate and William are still classed as "part time" royals and have not committed to being "full time" . This is with the full backing of the Queen and Prince Charles. That is why she is not out every week and tends to do 2 - 3 appearances in 7 - 10 days and then we don't see her again until the next month. The Royal correspondent for the Telegraph Newspaper states that she is still on "maternity leave" officially. This is in an article today about them seeking a full time nanny for the tour in April and so that Kate and William can do more royal duties after the tour. This is all William - not Kate. William is the one calling the shots (read above). The Queen is trying to humor him while she can. That is my opinion. I will say this one more time as I used to work at the Palace. There is no such thing as a "part time' royal. They simply take on duties befitting their schedule and carry those out as they can fit them in. Willam and Kate take advantage of this grey area by remaining low key and working very little with the backing of the media who spin the lie that they are somehow 'part time'. They are senior royals. Their duties are fitted around their other commitments. At this point, their other commitments cover more of their time than royal duties and thus we don't see them out and about more often. Charlotte, please, please post THIS comment. One thing to remember is that more engagements would mean much less frantic attention to each one. I remember when Diana was a full time working royal before scandal made her a pathetic centre of attention, and a lot of her engagements got only marginal interest from the press. You might see one photo at the most, even if she wore something new. And if Kate starts to work, there will be less attention paid everytime she goes on a shopping trip. Once Harry chooses a bride, attention will shift as well. And if Kate would take on a bit more, we would get more of a sense of who she is, not just what she wears. Eventually, attention dies away, Charles used to be photographed constantly. Now he wishes for that leval of publicity. Hiding Kate and William away doesn't bring more to Charles. I doubt any of us could say what he did this week unless it's something remarkable like visiting flooded areas. I don't think there is a conspiracy to keep Kate out of sight, I think it's her own reluctance. But if there is a plan on Charles' part, it certainly isn't working. I agree with you completely. If and when Kate starts to attend more engagements, the frenzy will subside, but probably only to a gentle roar. I think the public will continue to be fascinated by them because they are young and glamorous. I would like to see Kate take on more engagements, because while I love to see what she wears, a steady diet of fashion without substance is a little tiring. However, I don't see her really taking on a lot more engagements for a number of years yet. Now that George is growing up I'm sure they will want to expand their family and Kate's time will be spent raising her children. I do think it is something to do with Charles. He didn't like being outshone by his own wife, I can't imagine he would like being overshadowed by his son's wife. I also wonder at the lack of any interviews with Kate and William. There was one when they got engaged, and that's been in. Is the Palace worried it would cause more attention or that Kate would misstep? There occured some Conversation between Friderick I Hohenzollern and Andreas Schluter in 1701 year. I concur with that completely. I don't believe there's any chance it's a case of Kate saying 'I don't want to do many engagements.' I imagine this is a strategic decision made by those at the top for whatever reason. I would love to see Kate wearing any of the jewels mentioned here. I think she will put a youthful spin on any of these pieces, even the brooches. I remember reading somewhere that she wasn't thrilled with the title of Duchess as she felt it was a bit dowdy and old sounding. But, hasn't she turned that around! Now the title Duchess seems so fun and hip!! I thought that this was an interesting insight into the Queen and Prince Andrew for the royal watchers out there. Ohhhh I love beautiful jewelry!